Blockchain technology is quickly becoming of increased relevance in the modern-day society. The stunning ability of blockchain to provide permanent solutions to glaring problems as increased it popularity. It is therefore imperative that you consult the best platforms for learning blockchain in your quest to master this new technology. Do you want to become a blockchain developer? 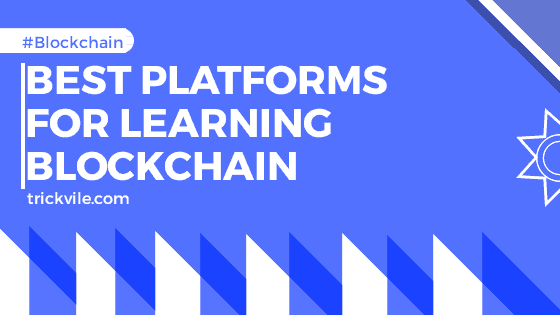 We will be highlighting 10 best platforms for learning blockchain. Looking for the best platforms to learn blockchain? Then search no further. We will be walking you through a list of user-friendly and content rich platforms. We will also be highlighting some example top-rated courses. Some courses are paid while others are free. However, it is important to note that as a blockchain developer you stand to make a lot of money. You should be willing to take a few paid courses once in a while to adequately equip yourself with the best and updated knowledge. FutureLearn is a platform that provides a lot of free online courses from top universities and large organisations. This website is listed as one of the best platforms for learning blockchain because of it attention to details. Futurelearn has courses on blockchain that focus on its disruptive potential on various sector of the economy. For unlimited access, they have a paid plan. Tests and certification are also available in the paid plan only. This particular course shows how blockchain ensure the optimization of the energy sector, improving on old processes and empowering customers. The course is open to beginners and lasts for four weeks (3 hours per week). Udemy is a platform that offers users with courses on multiple concepts and subject matters on free and paid bases. Udemy offers multiple detailed courses, from many talented and experienced tutors from all over the world. With Udemy, you could learn blockchain easily in a space of 4 to 5 months, depending on your learning speed. One advantage of using Udemy is the personal touch it has to it. And you can easily switch to another tutor if you do cannot understand your tutors teaching method. This is a best-selling video course (with a PDF glossary) that encompasses all the blockchain learning basics. Award-winning instructor on Blockchain and Bitcoin, George Levy, taught this course. Coursera provides a large number of online classes, courses, specialism and degrees. Full ‘degrees’ and specialism come at a higher cost as they are more advanced and include certification. Courses on Coursera will give you conceptual foundations you need to engineer secure software that is powered with the blockchain network. Coursera will give you access to knowledge that will help you integrate ideas from blockchain and use them to solve real life problems. This is a top-rated course that has been. This Course has the largest enrollment worldwide in terms of blockchain courses. After this course, you will be sure to know everything you need to about blockchain. This is an amazing and informative introductory course from Coursera that will teach you how Bitcoin works, how secure Bitcoin is, and also the mechanics of the blockchain network. Khan Academy qualifies as one of the best platforms for learning blockchain because it offers a large range of short video explainers and tutorials which are all completely free of charge. The topic of block chain is not left behind in its rich content as a lot of illustrative and understanding courses are made available for users. It doesn’t offer accredited courses, however, it is great for those looking for a taster of pretty complex subjects. This is a course that teaches students about the mechanics of a Bitcoin transaction. It’s an online learning platform dedicated to BlockChain Learning. It offers a 7 day free trial to the platform’s course library. This platform is listed among the best platforms for learning blockchain because it offers free and informative articles and videos that are sure to satisfy your Information need in terms learning blockchain. This is an introductory course to blockchain technology. It will show you how transactions are stored in blockchain, how mining works via consensus and the difference between permission and permissionless blockchain. All these juicy details in one place is going to be an interesting adventure. READ ALSO 18 Bad Smartphone Habits You Should Immediately Stop! This introductory course will teach you how to build a decentralized blockchain app with Ethereum. Dapps are fun and innovative substitutes to traditional applications. Dapps are powered by blockchain technology and that’s what makes them so amazing. This is another one of the best platforms for learning blockchain. Blockstrap is a company that I dedicated to providing web APIs for developers who want to get involved with blockchain. Blockstrap’s APIs have been tested on Bitcoin, Litecoin, Dogecoin, and Dash, as they are chain agonistic. This is a free presentation slide course for beginners on blockchain technology. It has four parts to it, and it can be taken anytime anywhere without any registration. This flexible nature will let you learn at your own pace. This is an awesome learning platform that amxam easily pass off as one of the best platforms for learning blockchain. This website is free for the first month subscription which a trial period. Use this if you ideally want to enroll for more than just one course and make the most of your learning blockchain journey. Using this platform and exploiting its wide range of blockchain learning resources, can really launch you into a comfortable point in the blockchain world. With this course, you will be able to learn all about the implication of decentralized, encrypted data storage along with understanding the concepts of mining, cryptography, distribution and smart contracts. This course is a very content rich tool that can equip you with the knowledge you need to understand and become a blockchain developer. This is an epic platform that provides doe its users a series of lectures and blogs on the various aspects of this rapidly growing and interesting technology. For quality assurance, certifications are divided into three levels of difficulty beginner, intermediate and advanced. Within this course, you will learn the structure of decentralized technology and other relevant technical skills for building enterprises and understanding blockchains. By the end of the lectures, you will have practical experience that can be used in further projects.